Nutritional Services | Akron Summit Community Action, Inc. Meals and snacks are provided and served family style in which food is placed on the table and the teacher and children sit together to enjoy the meal. Family style teaches portion awareness, hunger and fullness cues and exposes children to a wide variety of foods. Children learn and practice social and motor skills such as taking turns, passing food and scooping and pouring. Teachers model appropriate meal time behavior and lead the children in pleasant conversation. The time is also used to education children about nutrition. Menus are developed by a Registered Dietitian who ensures meals are nutritious, attractive and meet the United States Department of Agriculture (USDA) child requirements. 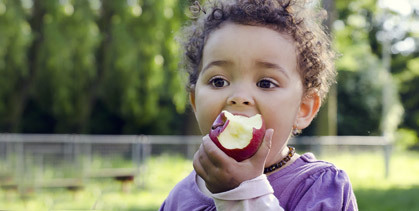 Meals provide 1/3 to 2/3 of the Recommended Daily Allowance of nutrients for preschoolers. Copies of menus are posted at each center and sent home to parents. Head Start children’s heights and weights are taken, at least once during the program year. Heights and weights are measured to analyze growth pattern for children ages three to five. Parents will receive letters with their children’s measurements and nutrition /physical education, at least once during the school year. Formula will be provided by the center. Breast milk is encouraged and must be labeled with the infant’s name, date of milk expiration and will be refrigerated immediately upon receipt at the center. All centers have a designated area for breastfeeding your child during school hours. Infants are always held during bottle feeding times. To file a program complaint of discrimination, complete the USDA Program Discrimination Complaint Form, (AD-3027) found online at: ascr.usda.gov, and at any USDA office, or write a letter addressed to USDA and provide in the letter all of the information requested in the form.